It’s been long awaited but last week saw the return of Apple’s Keynote conference and with it the future of iPhone was revealed. It was only fitting that this 10 years of iPhone keynote be held as the debut showcase in the all new Steve Jobs Centre in Apple Park, California. His tribute to Jobs was at the forefront of the entire conference, as he dedicated the Centre and ever developing Apple universe to him. The Apple Park, originally a dream of Jobs’, is said to open fully soon, with Apple designers, technicians, creators and every corner of the Apple universe having a place at the new Apple Park HQ. This park is raved to be “seamless with natures” and 100% renewable energy efficient, which I must admit is a huge achievement considering the size and productivity of this park. Cooke also went on to give his thoughts and prayers to those affected by the horrific natural disasters of Hurricanes Harvey and Irma across the US states of Texas and Florida as well as to the Caribbean Islands. After not only already donating their time and money to the causes of Hand in Hand and American Red Cross, Apple have made it easy to donate to these relief charities via Apple Pay and iTunes. The first new product announced was the Apple Watch Series 3. They raved that in last quarter’s report the Apple Watch has seen a 50% growth since the launch of the Series 2. This growth has supposedly been so exponential that Apple are now voted the number 1 watch in the world, taking over Rolex that previously held the crown. The new series 3 watch will come with the all new WatchOS4 comes with a redesigned workout feature and an all new feature for avid swimmers. There’s also to be a smart activity coaching feature and enhanced heartrate features. The focus of this new watch seems to largely be on the heartrate app with new measurements taking your resting heartrate and also recovery heartrate, which give indication to getting towards a healthier lifestyle. Furthering this concern with the users’ health, the new Series 3 watch will inform the wearer of any unexpected or unusual changes in their heartrate that seem unexplained. This sort of feature is all a part of their strive to help suffers of Atrial Fibrillation. The Apple Watch Series 3 will be available with inbuilt phone service and 4G. Currently in the UK the only provider to support this is EE, however it’s likely other providers will eventually follow. This allows you to leave your phone behind and still receive calls, reply to messages and ApplePay as you would with your iPhone. As an induvial attempting to get more into my fitness, this is an appealing feature to myself. It’s a real pain lugging your phone around the gym or on a run, but as a person of our modern day, I must say I’m rather attached to it. The Series 3 Apple Watch would give me that freedom to leave it behind from time to time, and that’s the biggest selling point for a product that otherwise never particularly spoke to me. Not only will your regular cell service work on the Series 3 but Apple Music will also provide their full album for the Watch and working with the AirPods and other Bluetooth headphones, the Apple Watch becomes even more of a runner’s companion than ever before. The watch will start at £399 ($399) for the ‘cellular and GPS edition and £329 ($329) for the simply GPS edition. So yes, it is a pretty pricy thing to put on your wrist, though EE are offering monthly payments of £25 for 24 months to make it, appear as though, it’s more affordable. Next to be revealed was Apple’s all new Apple TV 4K. So, it’s same Apple library as Apple TV, with all your purchased films and games, expect this time, it’s 4K. What is interesting is that all HD titles will be priced exactly the same as the 4K version, and that in itself is fairly impressive. He Apple 4K works off a A10X Chip, which just so happens to be the same as the iPad Pro. It has a CPU that’s 2x faster than the current Apple TV and 4x faster graphics than the current model. Another feature speaker Eddie was rather impressed with was the new live sports feature. Live TV tends to be something we have to watch on a subscription, such as BT, Virgin Media, Sky or Freeview and Apple TV, Netflix, Amazon Prime etc. have all been about streaming. So, what this live sports feature will do, is combine the streaming side of TV with a live sports side that’s accessible and is customisable to be personalised to the teams you support and the sports you watch. 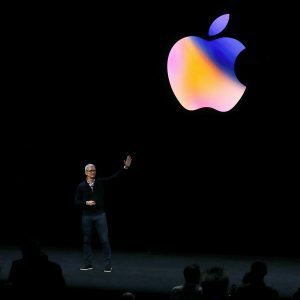 The demonstration showed what sports were live at the head of the Apple TV homepage, which just so happened to coincidentally be the speaker’s favourite sports team. Not only that but Apple TV games are said to be improving, with independent developers such as That Game Company (creators of the likes of Flower and Journey) creating an exclusive Apple TV game known as Sky. As a fan of That Game Company, this was a pretty effective sell for me. Our next product was that that everyone tuned in to watch the keynote for – the iPhone. Cooke stated that “Apple has always believed that technology infused with humanity can improve people’s lives and change the world” and supposedly this is what we can expect with the new iPhone 8 and 8 Plus. The 8 and 8 Plus will come with an all new and reinforced glass front and back with the same curved aluminium band we’ve seen since the iPhone 6. The colours we can expect to see are silver, space grey and gold – though the glass does appear to make the hue of this gold more similar to that of the fan favourite rose gold. The rave is that the design features aerospace grade aluminium, a 7-layer colour process, 50% deeper strengthening layer and a glass finish reinforced by steel. This is said to result in the most durable glass in a smartphone ever that is, of course, both dust and water resistant. In theory therefore, this would mean that dropping your phone now shouldn’t result in a screen shattered into a thousand tiny cracks (as easily as before) – though I’ll believe that when I see it. The iPhone 8 features a 4.7inch display whereas it’s larger sibling the iPhone 8 Plus features a 5.4inch display. Both of which house a true tone technology and an all new, Apple designed, A11 bionic chip. This chip is said to be have a 25% higher performance rate than the A10 and a 70% faster efficiency rate than its predecessor. The camera of the iPhone 8 is 12MP and is said to be 80% more light and power efficient than previous cameras. The 8 Plus features a 12MP dual lens, with both telephoto and wide-angle lens as with the iPhone 7 Plus. As does it’s larger sibling the 8 Plus, however the 8 Plus also supports a dual photo lens of telephoto and wide-angle lenses for that added depth feature. The 8 and 8 Plus both now come with Portrait Lighting for the Portrait Mode camera function introduced with the iPhone 7 Plus. This lighting contours the face before and/or after taking the photograph and uses natural light, not filters to change the lighting on the subject’s face. The video quality in the “highest quality video capture in a smartphone, ever” supposedly as the video adjusts in real time, pixel by pixel to create 4K video. A new feature is that of augmented reality. Similar to what many Pokémon fans have already witnessed with Pokémon Go, more company are introducing a virtual world into our real one and are more capable than ever to do so through an iPhone. The iPhone 8 hasn’t seen the reintroduction of a headphone jack. Unfortunately, it seems Apple just cannot admit that fault and so the AirPods will remain the recommended way to listen to music through an iPhone, though the bundles tend to come with regular Apple EarPods and a lightning to audio jack cable instead. A new feature Apple are introducing, that other smartphone companies, such as Samsung, have also taken this new way of charging forwards. Using Qi technology both Samsung and Apple will allow their devices to be charged without the plugging in of a cable. Many businesses around the world are already set to support Qi wireless charging, such as car company BMW, Audi, Honda, Mercedes and many more. There’s also hotels such as IBIS and Marriott, the travel industry such as JFK airport and the Eurostar trains, phone companies such as EE and Vodafone and, of course McDonalds restaurants. The idea is that users will be able to travel anywhere without the need of taking their individual charging cables and will therefore be able to charge their devices in multiple locations – though cable charging is still an option with the iPhone signature lightning lead. Apple CEO Tim Cooke then stated that that wasn’t it and there was “one more thing” they wanted to showcase, much to the audiences’ delight seen in the whoops and cheers. The rumoured iPhone X is true, though pronounced iPhone 10. So, when it comes to the iPhone 9, is that a step back or? Regardless, Apple stated they have been working on the iPhone X for several years, trying to come together to make something that will be “the future of smartphones”. Cooke also stated that they have revealed “a product that will set the path for technology for the next decade” and unfortunately Apple, I must disagree. The iPhone X, whilst fairly interesting comes after the release of the Samsung Galaxy S8 and the reveal of the Samsung Galaxy Note 8, both of which have far more technological advancements than the X appears to have. Slightly disappointing, even for an Apple fan as myself. The design is edge to edge, in a sense Apple’s answer to the infinity display. The screen still has edges and bezels around it, but nothing like the iPhone 8 and previous has. It too is water and dust resistant, with the same glossy glass finish as the iPhone 8 and 8Plus. This model comes in silver and space grey only however. It’s retina display has been defined as a ‘Super Retina Display’, an all-new feature for iPhone’s with OLED display technology. The screen is 5.8inches with a resolution of 2436 x 1125 – that’s 2.7 million pixels or 458 pixels per inch. As there’s no home button, you can either raise the iPhone X or simply tap the screen to wake the device up. As there’s no home button you can also now swipe up to return to your apple homepage and hold the side button to wake Siri, your (still rather deficient in my opinion) AI companion. Another feature they frankly made quite a song and dance about is Face ID, a new way to unlock your phone. Except it’s not particularly ground breaking as several models, such as the Samsung Galaxy Note are using similar technology now also, it just keeps them up with the crowd. What’s perhaps most awkward is that on initial testing, Face ID failed to unlock the iPhone, and only upon trying a second time later in the conference did it work as advertised. Face ID is raved to noticed changes in your face, such as aging, growing a beard, changing your hair, putting on glasses and so on. The statement is that Face ID cannot be spooked by pictures or even prosthetics as tested with Hollywood mask designers. It’s said that the chances of an individual being able to use your Touch ID is 1 in 50,000. Face ID is said to raise that number to 1 in 1,000,000 (except for genetically identical individuals, i.e. twins). It’s a great statistic, though I’m unsure as to which 1,000,000 people this has been tested on to come to this number. The control centre has been moved, so now swiping from the top down opens the control panel whilst swiping from the bottom up returns to the homepage. 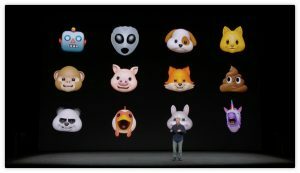 Another new feature, which I must admit is pretty cool, is the Animoji feature. Your favourite emojis can now be used to track your facial movements, expressions and even be used to send voice recordings, mapping the movement in your face. It’s not an essential feature, but it’s fun. The iPhone X has a similar dual 12MP camera with added dual optical image stabilization – why the iPhone 8 and 8Plus couldn’t have this also is beyond me. The iPhone X has all other features of the camera in iPhone 8, except it also has added portrait selfie mode. Again, why the iPhone 8 and 8 Plus wouldn’t have this feature I’ll never know. Whilst no battery life or battery capacity was mentioned, they stated that the iPhone X will have 2 hours more battery life in that the iPhone 7. Again, the iPhone X has the same 64GB or 256GB models as the iPhone 8 except all these ‘extra features’ step the price up to £999 ($999). Pre-orders start from 27th October and shipping begins from the 3rd November. According to Apple CEO Tim Cooke, “iPhone X really is the future” – unfortunately, I can’t say I agree. The most impressive reveal of this conference for myself would have to be that of the Apple Watch Series 3 model. Unfortunately, I feel three phones this time was perhaps just a bit too much for Apple to cope with. Either that or they’re purposely holding off from what they really can do. Considering prices of other newly released smartphones – Samsung, LG, One Plus – I feel Apple need to be offering more for the price they’re expecting for these devices, the iPhone X especially.